It might be sports cars that normally get all the limelight at big motorshows, but Audi's Avant Prologue could just steal some attention away from the tranche of supercars appearing at next week's Geneva motor show. 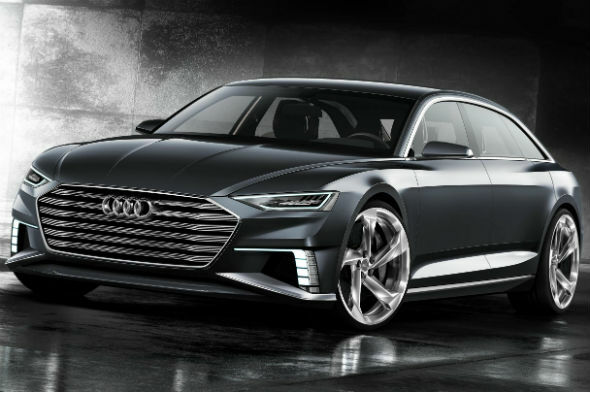 This sleek five-door show car should give an insight into future Audis and shares much of its style with the Prologue coupe concept that the company unveiled at last year's LA motor show. Measuring in at 5.1m-long, the Avant Prologue offers four individual seats and a high-performance hybrid system, which produces a total of 449bhp courtesy of a diesel engine and electric motor. Helping to transfer this muscle to the Tarmac is Audi's Quattro four-wheel drive system and oversized 22-inch alloy wheels. This concept also offers the ability to charge up the hybrid batteries by plugging the car in. Sharing its hybrid tech with the Q7 e-tron Quattro, which will be launched in summer 2015, the Avant features a 3.0-litre diesel engine along with an electric motor integrated into the eight-speed automatic gearbox. Despite the show car's large size it is claimed to be capable of sprinting to 62mph in a mere 5.1 seconds and continuing on to a top speed limited to 155mph. Fuel consumption is equally impressive, returning up to 176mpg and CO2 emissions of just 43g/km. Meanwhile the electric batteries can power the car for up to 33.6 miles on a full charge. On the inside the Prologue offers up a luxurious lounge-like feel with its simple, dark-hued interior, straight lines and slender seats. As for the outside, the Avant concept features powerful laser headlights, and chic aluminium window surrounds and wing mirrors.